Roof slab PAROC ROS 50 is non-combustible stone wool insulation for use as a load bearing thermal insulation layer of existing and new flat roofs. The roof insulation slab is developed to provide sustainable, hard and fire safe bedding for most types of flat roof coverings as well as insulating the bearing layer in renovation sites. 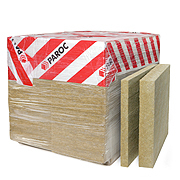 PAROC ROS 50 insulation is used in concrete and corrugated steel constructions as a single-layer insulation. The thickness of the insulation layer should be below 150 mm. The compressive stress of the product is 50 kPa, which means that the slab can carry a 5000 kg/m2 load during installation and use. Plastic Package, Plastic Packages on a Pallet or Loose Product on a Wooden / Stone Wool Pallet. Stone Wool Pallets available in Sweden.